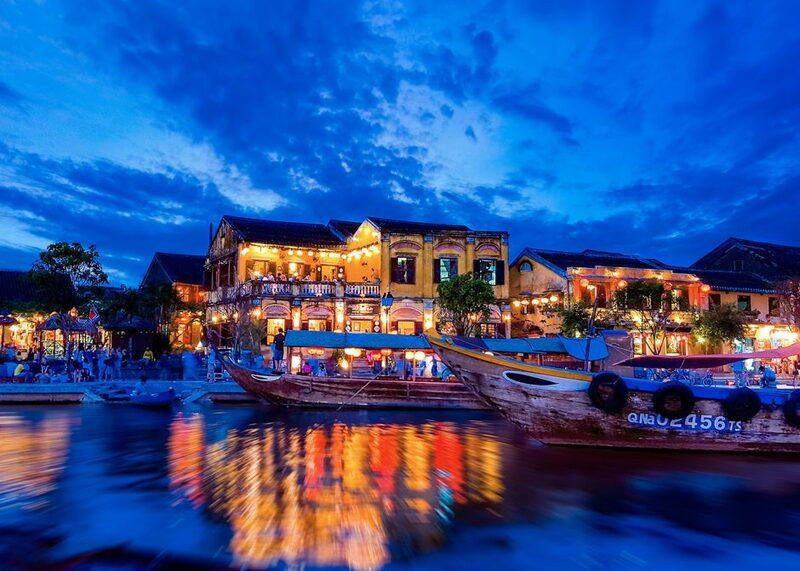 When it comes to sheer charm, Hoi An is hard to beat. Especially when you arrive there on New Year’s Eve. I decided to visit Vietnam’s legendary UNESCO protected town with my girlfriend on a last minute whim. We arrived on New Year’s Eve with a persistent rain falling and after contemplating holing up in our huge room at Karma Cây Tre for the night, roused ourselves and commandeered two of the resort’s cute little bicycles instead. We were glad we did. A 10 minute ride along the riverside road took us to Hoi An’s old town, which was thronged with revellers from all over the world. Soft lights hung from trees and in the facades of shops and coffee and tea houses. Aside from the odd local happily honking their moped through the crowds, Hoi An’s old town is given over exclusively to pedestrians and bicyclists. There is a simple joy in strolling among the maze of quaint little streets lined with boutiques, galleries, Chinese temples, markets, restaurants and street hawkers. Following our noses, we emerged from a side street back to the river, which was filled with candlelit boats. It turns out that on one night only on New Year’s Eve, the boats are allowed to ply the river, taking on board passengers who are invited to make a wish as they set a paper lantern afloat – hundreds of them were scattered across the water among the boats, making for a magical scene. Afterwards we found a quiet little corner eatery with shabby chic decor – a mix of Vietnamese and French colonial influences – where we had our first experience of the legendary local dish, Cao Lau – an utterly unique & thoroughly delicious noodle concoction comprising five-spice seasoned pork, mint, paddy herb, Vietnamese fish leaf, basil and crisp lettuce. There are lots of local legends around the dish, whose origins are obscure. The noodles are said to be washed in a special lye-laced water guarded by a single family – a story that’s almost certainly apocryphal. And it isn’t recognisably Vietnamese, Chinese or Japanese in character. When made properly however – as in this case it really was – it is something very special.